CH Como – Harriet – Hopkins E 5th St. (St. Paul) – Wabasha St. – Minnesota State Capitol – Como Ave. (St. Paul) – Lake Como – Como Ave. (Minneapolis) – 4th St. SE – Hennepin Bridge – Hennepin Ave. – Lake Harriet – Hopkins / [CH*] France Ave.
SL Selby – Lake Broadway (St. Paul) – E 4th St. – Kellogg Blvd. – Selby Ave. – Marshall Ave. – Lake St. – Hennepin Ave.
BC Bloomington – Columbia Hts. 54th St. – Bloomington Ave. – 6th St. – 4th St. S – 2nd Ave. S – St Anthony Falls Bridge – Central Ave. – Columbia Hts. BJ Bryant – Johnson (56th St. / [BJ*] Penn Ave. – 50th St.) – Bryant Ave. S – Lyndale Ave. – Hennepin Ave. – Hennepin Bridge – Hennepin Ave. – 8th St. SE – Johnson St. – 33rd Ave.
CP Chicago – Penn 54th St. – Chicago Ave. – 6th St. – 2nd Ave. S – 8th St. S – 7th St. N – Emerson Ave. – Broadway – Penn Ave. N – Thomas Ave.
FP Ft. Snelling – Minnehaha – Plymouth Ft. Snelling – Minnehaha Falls – Minnehaha Ave. – Riverside Ave. – Cedar Ave. – Washington Ave. – Plymouth Ave.
GF Glenwood – 4th Ave. Glenwood Park – Glenwood Ave. – 1st Ave. N – 6th St. – 4th Ave. – 48th St.
GM Grand – Monroe 48th St. – Grand Ave. – Nicollet Ave. – 2nd Ave. S – St Anthony Falls Bridge – Central Ave. – Monroe – Washington St. – 27th Ave.
OH Oak – Harriet Yale Ave. – Oak St. – 4th St. SE – Hennepin Bridge – Hennepin Ave. – Lake Harriet – Xerxes Ave.
DP Dale – Phalen Lake Como – Dale St. – W 7th St. – E 7th St. – Forest St. – Phalen Pk. HC Hamline – Cherokee Hts. Hamline – Thomas Ave. – Minnesota State Capitol – Wabasha St. – Wabasha St. Bridge – S. Wabasha St. – Winifred St. – Cherokee Hts. RS Rondo – Stryker Dunning Field – Rondo Ave. – W 10th St. – Wabasha St. – Wabasha St. Bridge – S. Wabasha St. – Stryker Ave.
SC Snelling Crosstown Como Ave. – Snelling Ave. – Highland Pkwy. SP St. Clair – Payne Cleveland Ave. – St. Clair Ave. – W 7th St. – E 7th St. – Payne Ave. – Maryland Ave. – Kennard St.
Tram routes in Minneapolis-St.Paul were identified by the main locations they passed by. The route identifiers used on the maps and below are strictly for convenience, and were never used by the Twin City Transit Co. itself. Streetcar lines: ca. 320 km. Horse-powered: St. Paul: July 1872 - 1892; Minneapolis: 2 Sept. 1875 - 1892. Electric: Minneapolis: 24 Dec. 1889 - 19 June 1954; St. Paul: 22 Feb. 1890 - 31 Oct. 1953. Light rail: 26 June 2004 - today. 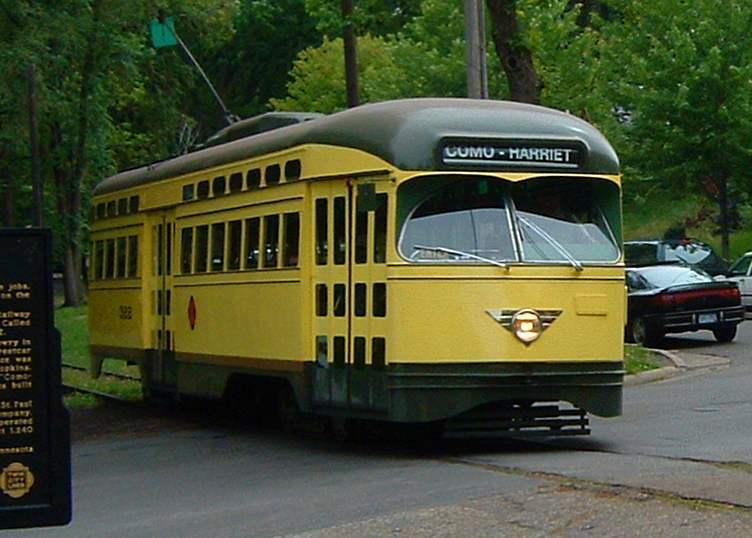 The Minnesota Streetcar Museum runs historic Minneapolis - St. Paul streetcars at two museum locations: adjacent to Lake Harriet in SW Minneapolis and at Excelsior, 15 miles (24 km) west of Minneapolis. Carter, J.M. "Minnesota: Streetcar named conspire", Tramways & Urban Transit, Nov. 2003 (66: 791), p.413-415. Diers, J.W. 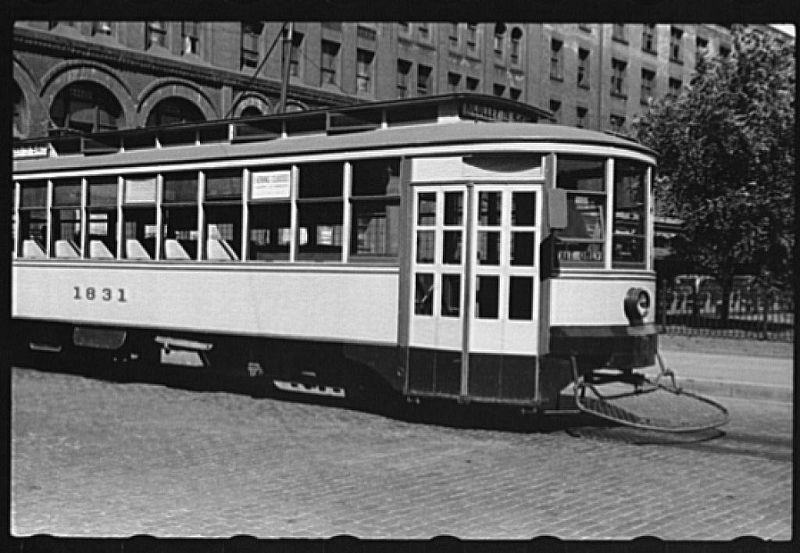 & Isaacs, A. Twin City Trolley: The streetcar era in Minneapolis and St. Paul. Minneapolis & London: University of Minnesota Press, 2007. Simons, V. "Minneapolis - St. Paul: Reconnecting the Twin Cities", Tramways & Urban Transit, Sept. 2014 (77: 921), p.362-367.